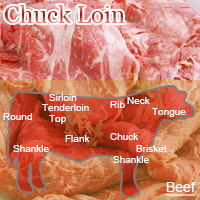 Beef chuck loin is red meat located between shoulders and rib roast. It can used to make steak and beef stew. Chuck steak is a type of steak taken from the beef cut chuck. It is said to be sometimes referred to as No. 7 steak due to the fact that it resembles the number seven. In the UK, it is referred to as braising steak. The calories in Beef Chuck Loin per 100g(1cut ) is 240 calories. Beef Chuck Loin is calculated to be 240Cal per 100 grams making 80Cal equivalent to 33.33g with 17.9g of mostly protein、17.4g of fat、0.1g of carbohydrates in 100g while being rich in vitamins and minerals such as Vitamin B12 and Zinc.